Rather than go into to much painful details of my trip this past weekend, I am going to offer some videos clips and let the pictures do most of the story telling. Needless to say, this was one of the most unique, fun, and educational experiences I have had in China. 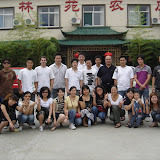 The people on the trip were a blast and very accepting of the waiguoren (foreigner). Right now, I am in Shenzhen. The city is located on the border of China and Hong Kong. I visited here a few weeks ago and now I have returned for a little bit more work. I will be leaving tomorrow evening for Thailand and will not return to Wuxi till the following Wednesday. Updating the blog will be difficult, but I will try to get an update in here and there. While in Thailand, I will be attending a festival. It is called The Phi Ta Kohn Festival. I am meeting up with my good friend Maeve, who I biked across America with, and about thirty other Peace Corp volunteers who are all living and working in Thailand and other nearby countries. The next video is a traditional dance from Anji. The girl closest to the camera at the start of the video is the one I ended up getting married too (see two videos down and the pics for more on that). This video was shout in downtown Anji at the McDonald's I walked past. No words can describe the Empire that is McDonald's. The last video is a short "shout out" to my parents with my new wife. Doesn't she look happy! Finally, to fill you in on the remainder of the weekend, check out the pictures by clicking on the picture box below. Hahaha. I haven't heard that song in years. I expect that to be the first thing you teach your new wife! Glad to see you are having such a good time. Definitely jealous. Tokyo is hot and busy, that's about it. But I'm getting ready to take my trip with my fiancee soon across most of Japan. Should be fun. Keep posting man. I love it!